I would like to write in support of your comments on the Sivand Dam. As far as I am aware, the dam on the Pulvar River will create a thirteen-kilometer lake within the limits of the Tang-e Bulaghi. This project is not intended to flood the precious site of Pasargadae (which thanks to the efforts of the Iranian Cultural Heritage and Tourism Organization was named as a World Heritage Site just over a year ago) nor will it flood the extremely important site of Persepolis, which lies over 35 km downstream from the dam. If archaeologists could have their way all dams would be situated in remote areas with no cultural significance whatsoever. But since the distribution of water and the distribution of human settlement have always been inseparable, perhaps especially in Iran, hydrological priorities and archaeological priorities are always likely to clash to some extent. From an archaeological point of view it is unfortunate that the Tang-e Bulaghi, lying on the path of the non-modern highway between Pasargadae and the rest of Fars -- and containing up to 130 sites (including caves, village sites,Parthian burial cairns, and Achaemenid irrigation canals) -- was not the scene of more concentrated studies before this moment. But there are never enough resources to hand for every deserving project, and it is noteworthy that the ICHTO invited Professor Shapur Shahbazi to undertake an intensive survey of the valley some eight months ago. This survey provided vital information, moroever, for the Iranian, Italian, French, German and Polish teams that then undertook rescue excavations within the valley during the first part of this year. Perhaps all of us can also hope that the date for the flooding of the valley can be postponed beyond this coming spring -- and that at least one more round of rescue excavations can take place. Undoubtedly, the Tang-e Bulaghi deserves such a further effort to document its place in Iran's long history. 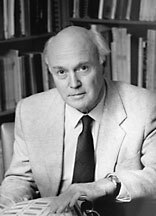 British archaeologist David Stronach is recognized as a pioneer of archaeology in Iran. Educated at Cambridge, Stronach was director of the British Institute of Persian Studies for twenty years beginning in 1961, during which time he also conducted excavations at Pasargadae, Nush-i Jan and Nineveh, as well as other sites in the middle east. Currently at the University of California at Berkeley, Stronach's recent work has involved him in joint American-Russian excavations at the Bronze Age site of Velikent in Daghestan. * BBC Persian: Will Pasargad go under water?